Still looking for a fuss free table decoration? What about this? 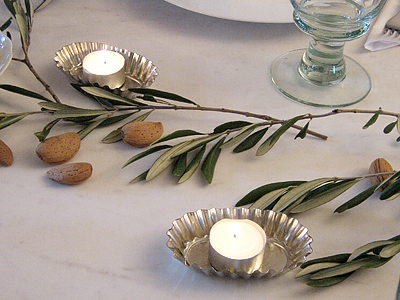 Olive twigs and almonds add a slightly Italian touch to a marbled table top. Put tea candles in small pastry tins for a subtle lustre. As simple as can be. 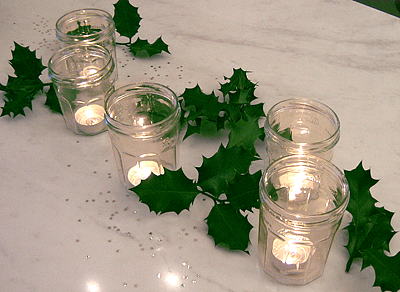 Tea candles in old jam jars and some holly twigs, all scattered with tiny golden stars. Raiding the cupboards. Small ivies in a baking tin, cookie cutters and tea candles in pastry tins. 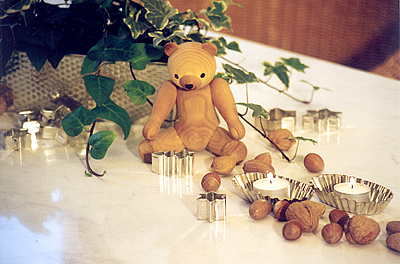 Nuts and almonds complement a small wooden teddy bear.